The Death & Co family persevered, and a liquor license was finally issued in 2010, the same year that Death & Co was named Best American Cocktail Bar and World’s Best Cocktail Menu at the Tales of the Cocktail Spirited Awards. 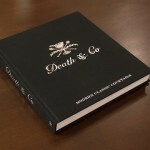 Each chapter of Death & Co builds on the previous one, beginning with “A Night at Death & Co,” and continuing with “Building a Bar,” “Building a Drink,” “Creating New Classics,” and “The Specs.” The book includes more than 500 cocktail recipes, starting with Phil Ward’s iconic Oaxaca Old Fashioned. But in addition to the expected recipes, tools and techniques, Death & Co delves deeper into the life of the bar itself, from a breakdown of a “typical” day/night, to a glossary of D&C lingo, a menu tasting, and even a collection of Death & Co’s worst cocktail names (“Short Rib” anyone? Bueller?). The behind-the-scenes theme touches the recipes as well, such as the insight that the Daiquiri is akin to D&C’s “secret handshake,” and the pre-shift drink of choice – so much so, that GDT (Gangster Daiquiri Time) has become a nightly ritual, in which a designated bartender creates a round of Daiquiris or variations for the staff. 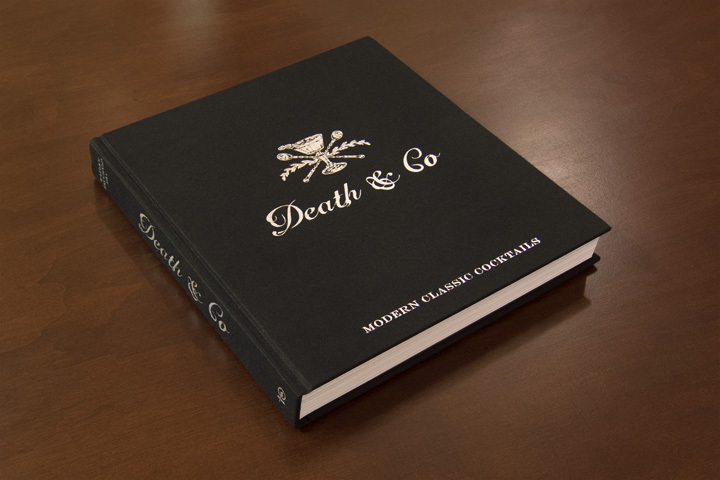 Death & Co features the work of Tim Tomkinson and his wife Katherine, who illustrate and design the bar’s menus. The handsome, cloth-bound book was designed by Katherine and features over 100 of Tim’s illustrations. Tim’s Death & Co logo is prominently featured on the cover, and the red titles that he created for the cocktail menus are included throughout the book. 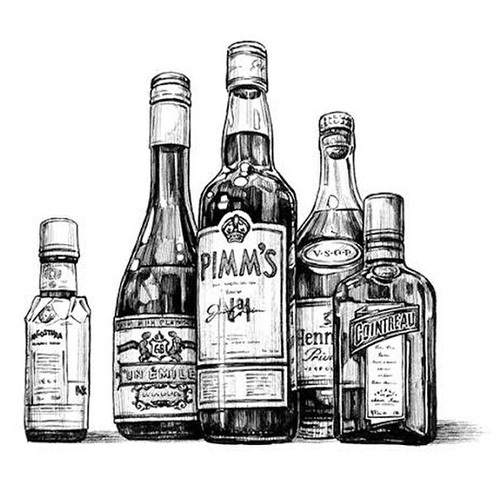 One of the book’s best and most unique features is “The Regulars,” a series of contributions from regular customers who share their D&C experiences and their favorite cocktails. A great anecdote comes from Anthony Sarnicola and Regina Connors, who recall the time Death & Co had engraved some of the regulars’ names on silver plaques on the backs of bar stools. Another memorable story is told by Cocktail Kingdom co-founder Don Lee, who looks back at his one and only shift at Death & Co.
Photo of “Death & Co: Modern Classic Cocktails” courtesy of Ten Speed Press. To celebrate the book’s release, Death & Co is taking over the Bowery Hotel in the Lower East Side on Tuesday, Oct. 7. The $75 ticket includes bottomless cocktails and a copy of the book. Following the New York launch, the Death & Co tour heads west to Los Angeles, where a book release party is taking place on Wednesday, Oct. 15 at Honeycut in Downtown L.A. For $55, guests will be admitted to the subterranean bar-discoteque to enjoy endless Death & Co cocktails mixed by the D&C crew, and then take home a copy of Death & Co. Tickets are on sale now at Eventbrite. Additional stops on the tour include Portland, San Diego, Washington D.C., Boston, Miami, Houston, Austin, Dallas, Seattle, Chicago, San Francisco and Denver.